You are at:Home»Herbs»Hyssopus officinalis Linn. Latin name : Hyssopus officinalis Linn. Description : Hippocrates and Dioscorides both recommended the flowers of this plant for respiratory complaints. Hyssop is considered anthelmintic, antiinflammtory, antiseptic, antispasmodic, antiviral, aperient, aromatic, astringent, carminative, cholagogue, demulscent, diaphoretic, diuretic, emmenagogue, a strong expectorant, febrifuge, nervine, pectoral, purgative, sedative, stimulant, stomachic, sudorific, tonic, vasodilator and vermifuge. Useful in chronic coughs, pleurisy, tight-chestedness, respiratory catarrh, sore throat, laryngitis, common cold, sinusitis and chronic bronchitis and also in hysteria, colic, uterine affections and indurations of the liver and spleen. It can also soothe stomach cramps. It eases nervous tension and anxiety and has a soothing influence on the nervous system. Hyssop appears to encourage the production of a more liquid mucus, and at the same time gently stimulates expectoration. This combined action clears thick and congested phlegm. As a sedative, hyssop is a useful remedy against asthma in both children and adults, specially when the condition is exacerbated by mucus congestion. Hyssop is the best source of diosmin, which also protects the capillaries and eases tissue swelling and water retention. 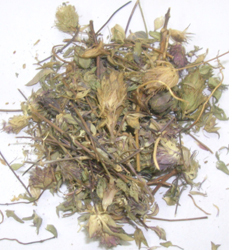 Recommended Dosage : 5 to 10 g powder of dried flowers. Contraindication : This herb is not recommended if you are pregnant, or suffer from epilepsy, diabetes or high blood pressure.